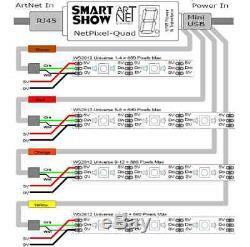 NetPixel-Quad is the smallest complete ArtNet to WS2811/2/SK6812 PixelLED interface. Driving up to a MASSIVE. And measuring just 73mm long by 24mm square. It converts 16 DMX universes of ArtNet data into NRZ data (which is capable of driving a variety of PixelLEDs and PixelStrips) and outputs this data split across 4 colour-coded outputs (4 universes per output). Full RGB & RGBW support. Four 3-pin JST outputs are provided to connect directly to your WS lighting strips or matrices. Each output will drive up to 680 WS2811/2 RGB pixelLEDs (2040 dmx channels), giving a total of 2720 Pixels. Alternatively if using SK6812 RGBW pixels, each output will drive up to 512 PixelLEDs (2048 dmx channels), giving a total of 2048 Pixels. Operational Mode is indicated by a simple Green 7 segment display. USB Powered (cable provided), although USB should NOT be used for powering LED strips. 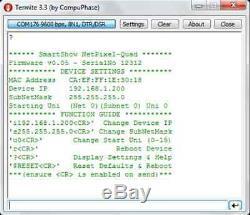 1 x NetPixel-Quad Interface 4 x 3-Pin JST Plug/Cable 1 x USB-MiniUSB cable (power, configuration & firmware upload) 1 x Instruction Manual. Please message for more details. For any further information please message us. 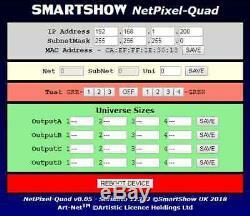 The item "SmartShow NetPixel-Quad 16 Universe ArtNet Art-net WS2812 Pixel LED Driver" is in sale since Friday, May 4, 2018. This item is in the category "Sound & Vision\Performance & DJ Equipment\Stage Lighting & Effects\Stage Lighting Controllers". 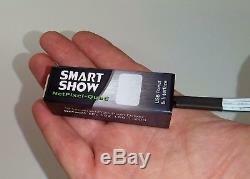 The seller is "smartshow-uk" and is located in Ramsgate, Kent. This item can be shipped to United Kingdom, Austria, Belgium, Bulgaria, Croatia, Cyprus, Czech republic, Denmark, Estonia, Finland, France, Germany, Greece, Hungary, Ireland, Italy, Latvia, Lithuania, Luxembourg, Malta, Netherlands, Poland, Portugal, Romania, Slovakia, Slovenia, Spain, Sweden, Australia, United States, Canada, Brazil, Japan, New Zealand, Israel, Norway, Indonesia, Malaysia, Singapore, South Korea, Switzerland, Taiwan, Thailand, Saudi arabia, South africa, United arab emirates, Ukraine, Chile.